Thornton L23 Dry & Steam Rug & Carpet Cleaning Services | Quality Property Care Ltd.
Bring back your gorgeous rugs with the help of a professional rug and carpet cleaning company in Thornton L23 Has your gorgeous rug lost its vivid colours and appears to be dull and worn? There easy and quick solution for you. Quality Property Care Ltd., a rug and carpet cleaning company which delivers top quality commercial and residential carpet and rug cleaning in Thornton L23 and the area. The rug and carpet cleaning services are delivered with the latest cleaning technologies and safe cleaning solutions. The professional carpet and rug cleaning team offers carpet spot and stain removal, dry foam carpet cleaning or shampoo carpet cleaning for all sorts of carpets and rugs. Trust the tvetted and trained cleaners to offer you top quality services at the best rug and carpet cleaning prices in the region. Call the professional customer service line or send an online request for a 100 % free quotation, and you will get an offer within 2 hours! The most effective deep cleaning for carpets and rugs is the wet deep carpet cleaning or the hot water extraction carpet cleaning from Quality Property Care Ltd.. It involves pre-treatment of the rug by hoovering with professional vacuum cleaners, and then carpet stain and spot removal, followed by the steam carpet cleaning. The qualified cleaners do a top quality shampoo carpet cleaning, using certified and safe cleaning solutions, which will not cause harm to you, your kids or your pets. The carpet or rug will have as much of the water removed from it, so it will need only 2 hours to fully dry off. If you get it, the cleaners can do a very nice deodorising of your rugs and carpets for an added clean and fresh effect. There are some carpets and rugs that cannot safely be cleaned with water, so the cleaners will offer you a safe and very efficient dry foam carpet cleaning. The special and perfectly safe foam is sprayed and rubbed into the rug or carpet, and after it has done its cleaning job, it is extracted with the suitable tools and vacuum cleaners. The same can be done with your mattresses, curtains or draperies and blinds. Dry carpet cleaning demands no drying time, so you can step on your carpet or rug just after the cleaners are done. 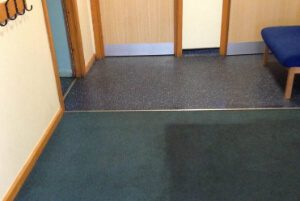 Steam carpet cleaning: hot water extraction procedure with maximum effect on dust and bacteria inside the fibres. The procedure is ideal for manufactured elements. The provider constantly invests a lot of assets into buying the most efficient, latest and safest carpet cleaning technological innovation. The cleaners are also regularly being coached to safely and properly use them, and to deal with a variety of spots and materials. The company Quality Property Care Ltd. was established in Thornton L23 back in 2005, and since then has been developing and innovating, to be able to catch up with all the latest trends in the cleaning business. The cleaners are all vetted, frequently trained and supervised for their cleaning performance. The machines, instruments and solutions used for the deep carpet cleaning, and the other cleaning services provided are certified, safe and modern . The cleaners deal with any kind of spots on your rugs or carpets, including: wine, oily stains, blood, rust, vomit, coffee, paint or tea. All services delivered are insured, and the quality is confirmed. Don`t wait to book our reasonable carpet cleaning company Thornton L23 today! Quality Property Care Ltd. is available for your requests! Do not wait to book any of our exclusively customized carpet cleaning services in Thornton L23 right now! Use the direct online booking form for bookings. Obtain a free quote immediately on 0151 673 0008!